Very nice buildings in Vilde way, opposite the Lehola busstop. The old cross of four streets that doesn't exist in this form anymore. That should be the cross of Tammsaare way and Mustamäe way. In the tower of Oleviste church. My mother called me while I was there and told me that we have new president now (Toomas Hendrik Ilves, and he still is). Mustamäe is seen in the center far away (right to the chimney), Väike-Õismäe towers begin on the right side of the picture. Isn't that fantastic? Ehitajate (Builders') way. And when I turned around, the view was like this. Today, this is also rebuilt with traffic lights. One of the best views ever! 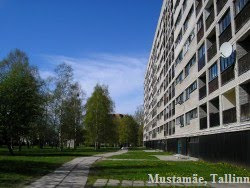 Also some nature, Mustamäe is not just blocks but a lot of nature as well.